hifi heroin: Whoever heard of the *304TH*?. The big amp is back out. Nope, my back isn't out.. yet.. the near 500 pounds (without chassis) of the big single ended breadboard is heating the shop again. I want to run the amp full range, so the multi-amped horns are down. I have an old pair of paper and alnico multi-ways that are low 90's efficiency- just perfect for making the amp put out some power. I have been listening happily, but I just thought the bass wasn't what I remembered. When I swapped out the 304tl for the 304th, I upped the output impedance of the amplifier. The amplifier and speaker form a system. There is an optimal value of output impedance for critical damping. A higher output impedance than required for critical results in overly full, slow, sloppy bass - underdamped. A lower output impedance than required for critical results in overdamped speakers - fast, controlled, but thin and unnatural. ...and here is my issue - speakers designed for tube amps should be used with tube amps. However, when solid state came along, output impedance dropped dramatically. Speaker designers had no choice but to accommodate the new amplifiers as they were 99% of the market. 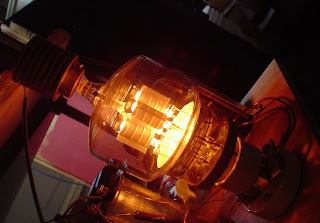 When you use a tube amplifier with a high output impedance on a speaker designed for low output impedance transistors, of course it has "flabby" bass... this is no reflection on the amplifier, but a reflection on the mating! It looks like the gates of hell have opened up from below and are helping to cherry up those plates. I'm thinking of building a 304THs SE amp also, can you please share some guild lines? Btw, do you have any info about the versions of 304TH? I happened to have 2 304THs with different plates.